A group calling itself the Guardians of Liberty, an anti-Catholic organization, attracted the attention of federal prosecutors in Spokane. 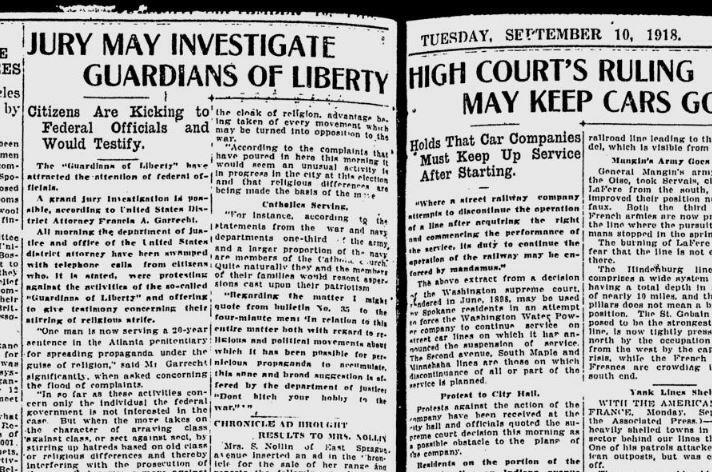 The Guardians of Liberty was a national movement that would later be allied with the Ku Klux Klan. One Atlanta man was already serving a federal sentence for “spreading propaganda under the guise of religion.” It apparently had some agitators in Spokane. From the transportation beat: The region’s rail transit system was showing early signs of trouble. The Inland Empire Railway, an interurban rail line, said it had been forced to cut train service because of paved roads “and increased use of autos” since 1911. The Washington Water Power Co. was also proposing to cut several streetcar routes.